Rules of Crime by L. J. Sellers: Synopsis and Online Purchase Options. Synopsis (from the publisher): When a call from his daughter, Katie, interrupts his much-needed vacation, Detective Wade Jackson knows it's bad news. As Katie tearfully announces that her mom — Jackson's ex-wife, Renee — is missing, Jackson suspects alcoholic Renee has climbed back inside the bottle that destroyed their marriage. But the truth is far worse: kidnappers have snatched Renee and are demanding ransom from her wealthy fiancé. The very same night, someone dumps a savagely beaten University of Oregon coed on the doorstep of the ER. 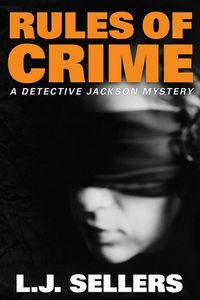 Jackson's protégé, Detective Lara Evans, must identify the unconscious victim, then track down the assailant with no leads to go on … except the whispered rumor of a secret sorority. Meanwhile, Eugene's new FBI liaison, Agent Carla River, takes charge of Renee's high-tech ransom operation while Jackson comforts his distressed daughter and retraces the steps of the mother she holds dear. But as the rescue takes a deadly twist and the suspects seem willing to let Renee die rather than crack under interrogation, Jackson worries that Katie will never forgive him if her mother is lost forever.